Give your bathroom a new look and feel with this piece from Kraus. Finish up your bathroom remodel with this beautiful single-control faucet. Its deck mounted design makes it easy to set up and looks great with many sink types. This faucet is WaterSense certified so you use less water to get clean and help the environment. Show off your style with this beautiful piece from American Standard. If you want to renew the look of your bathroom, this single-control faucet is perfect. This item's easy-to-install deck mounted design gives a fresh look to any counter top. This WaterSense certified faucet helps save water, money, and the environment. Complete your bathroom with this new, all-around useful piece from Kraus. You'll enjoy the easy use and modern design of this single-control faucet. Make your sink look even more beautiful with this item's easy-to-install deck mounted design. This faucet is WaterSense certified so it uses less water and energy. Show off your style with this beautiful piece from Kraus. If you want to renew the look of your bathroom, this single-control faucet is perfect. This item's easy-to-install deck mounted design gives a fresh look to any counter top. Save water and get the same clean with this WaterSense certified faucet. Add a modern look to any bathroom with this piece from Moen. Redo the look of your bathroom with this beautiful single-control faucet. Its deck mounted design fits with many sinks and isn't hard to install. This faucet is WaterSense certified so it uses less water and energy. Coda Single Hole 1-Handle High Arc Bathroom Faucet in Brushed Nickel with Lever Handle Give your bathroom a new look and feel with this piece from Kraus. Finish up your bathroom remodel with this beautiful single-control faucet. Its deck mounted design makes it easy to set up and looks great with many sink types. 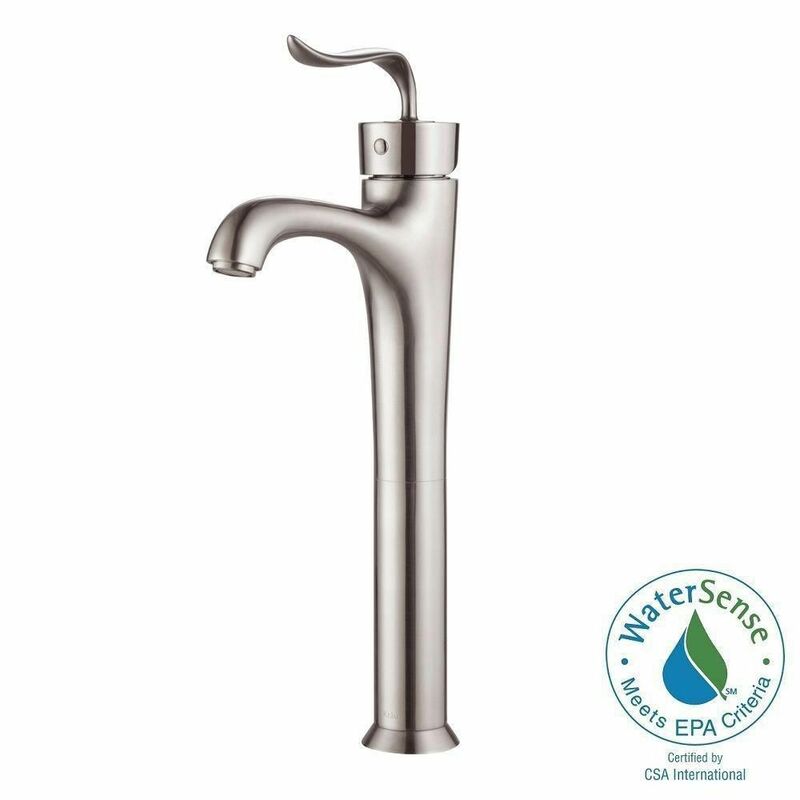 This faucet is WaterSense certified so you use less water to get clean and help the environment. Coda Single Hole 1-Handle High Arc Bathroom Faucet in Brushed Nickel with Lever Handle is rated 4.8 out of 5 by 14. Rated 5 out of 5 by Dovi from This faucet looks great and has great water pressure. ... This faucet looks great and has great water pressure. It is a perfect fit for the area around my vessel sink. Rated 4 out of 5 by Erika from The faucet looked as expected. Appears to be sturdy and... The faucet looked as expected. Appears to be sturdy and looks nice. My husband had no problems installing it. I didn’t give it an excellent because I don’t know how well it is going to hold up yet. Only time will tell! Rated 5 out of 5 by ljnel from Really nice! I bought this in brushed nickel and also in chrome for the other bath. Both are beautiful to look at and function perfectly. They were professionally installed so I can't really speak to that.